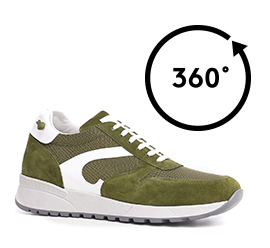 Handcrafted elevator sneakers, inspired by street style in green suede calfskin, military green technical fabric and white details on the sides and heel tab. Outsole in natural rubber. A ready-to-wear shoe designed for the city life which will enhance any outfit.